Samnaun has been described as the only Bavarian-speaking municipality in Alemannic-speaking Switzerland on the basis of a study done in 1924. Hints in the literature about the presence of other varieties for everyday communication – an intermediate variety on the dialect-standard-axis as well as an Alemannic dialect – have not resulted in more recent research. 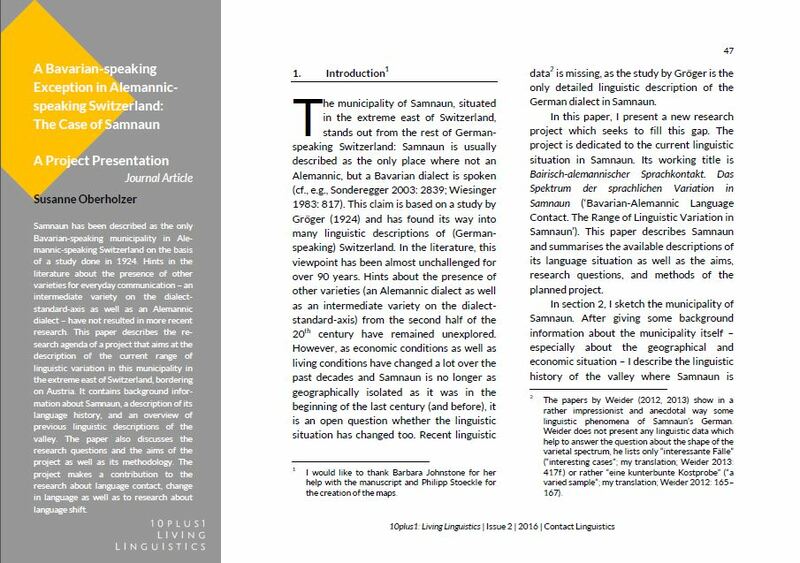 This paper describes the research agenda of a project that aims at the description of the current range of linguistic variation in this municipality in the extreme east of Switzerland, bordering on Austria. It contains background information about Samnaun, a description of its language history, and an overview of previous linguistic descriptions of the valley. The paper also discusses the research questions and the aims of the project as well as its methodology. The project makes a contribution to the research about language contact, change in language as well as to research about language shift. Susanne Oberholzer studied Italian Linguistics and Literature, German Linguistics, and Modern Nordic Studies at the University of Zurich. In 2015, she completed her PhD in German Linguistics on language use and language attitudes in German-speaking Switzerland. From January 2015 until September 2016, she has been a postdoctoral research fellow at the LMU Munich. From October 2016, she continues working on her postdoctoral research project (on Bavarian-Alemannic dialect contact in the Alps) at the Universities of Salzburg and Vienna funded by an Early Postdoc Mobility fellowship of the Swiss National Science Foundation. Her research interests include variationist linguistics, sociolinguistics, historical linguistics, and contact linguistics.